Having problems with some of your home DIY tasks? 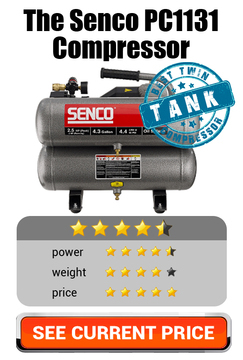 Are you looking for a top rated air compressor to make light of some of the tougher tasks? 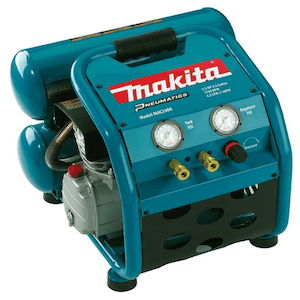 For many aficionados, the Makita MAC 2400 Big Bore is their go to air compressor. User after user screams about the quality of the Makita MAC2400 Big Bore 2.5 HP but what exactly is all the fuss about and is the Makita Mac 2400 a good way to spend your hard earned? If you are new to the worlds of air compressors, and many are, then it can be difficult to tell your PSI from your CFM so read on for our summary. The problem here is where we start; there’s so much to like. First off, it’s an excellently built machine. Whoever thought about incorporating a casing that protects the machine from bumps and you from burning your fingers (it runs hot when you take on a tougher task) by enclosing the works in a roll bar and finger guards? Genius might be a bit strong but its quality design all the way. Next up, the Mac2400 makes gentle use of your electrical supply at home. The 2.5 HP electric motor is designed to have a low amp draw on your supply. For the less technical – go on admit it, that’s you – this means that even under heavy load the MAC2400 is less likely to trip power circuits so no browsing the inter-web looking for home DIY electrical advice needed! Oh, and while we’re on the subject of likes; the pump is made from cast iron so even if you’re asking a lot from it, it’s designed for a quick recovery. Once the tanks are filled the cast iron fins on the motor, mean heat is dissipated quickly so there’s little hanging around waiting for it to cool down. Are we picky or what? Even such a popular compressor can still have little imperfections. First off – the weight, 81 pounds (that’s 40 bags of sugar to you and me) is a lot to carry around, especially if you need it at one end of the house and then back at the other straight after, all a bit unnecessary really. Then, sticking with the “less technical” idea, the quality of the user guide leaves a bit to be desired. If you’re not familiar with using an air compressor, it’s not going to be as helpful as it should be. It reads like a lot’s been lost in translation, hmmmm. Often cited as good enough for professional users, the MAC 2400 is more than a match for any job at home. So whether you’re thinking of inflating a few pool accessories or trying to make the roof extra safe in the face of the next storm, this is a compressor to consider. 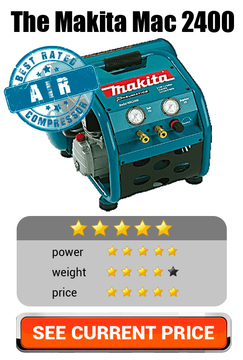 If you’re familiar with working with air compressors, then fill your boots with the MAC2400. If however, you’re less so, you might feel let down by the documentation. It’s also less than ideal if you have a lot of floor space to cover. Lugging this 81-pound behemoth from one end of a large home to the other is not easy as the compressor is not mounted on wheels. Not really for the novice or less than string DIYer. If you’re looking for something that will not get on the neighbour’s nerves, and still offers you performance levels that are perfect for your home improvement projects you could do worse than examine the Makita MAC 2400 Big Bore in more detail. On the other hand, if you can recognise a dead cert when you see it then rush out now and buy your compressor at the best price you can get it.